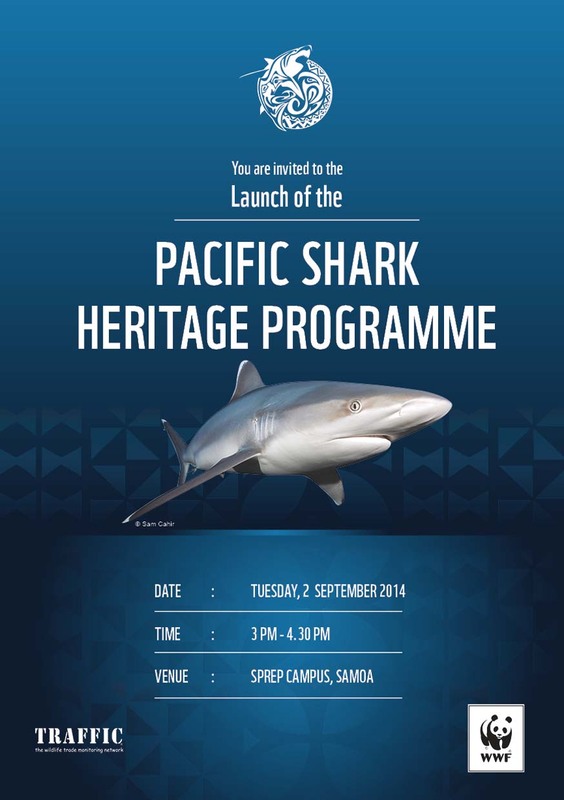 3 September, 2014, Apia, Samoa - The Pacific Shark Heritage Programme was launched this week at the campus of the Secretariat of the Pacific Regional Environment Programme (SPREP) during the Third United Nationsl Conference on Small Island Developing States in Apia, Samoa. The Pacific Shark Heritage Programme, a joint effort by the Worldwide Fund for Nature (WWF) and TRAFFIC, will ensure that shark and ray species are managed under viable long-term strategies in Pacific waters, The aim of the Programme is to work with governments throughout the Pacific region to assist them in sustainably managing their shark and ray populations while safeguarding cultural history of the Pacific island nations. "There are two main objectives we are seeking to achieve as part of this work. The first is to stop the severe decline of shark and ray populations throughout the Pacific and around the world. The second, equally important issue is to ensure the unique island cultures of fragile coastal states is protected and preserved for future generations," said Mr Ian Campbell from WWF's Global Shark team. "As part of the launch of this initiative we have produced a book "Shark Gods of the Pacific" which documents the legends and fables of sharks and rays from Pacific Island countries." The Secretariat of the Pacific Regional Environment Programme (SPREP) is pleased to partner with WWF in this initiative and will explore all avenues with WWF and other willing partners to try to restore the balance as the short-term gains from shark fins are heavily outweighed by the long-term damage caused.
" We have become increasingly concerned at the rapid decline in the abundance of many species of sharks and rays in the Pacific Islands region. Sharks are a vital component of both pelagic and coastal ecosystems, and their over-exploitation has disrupted trophic relationships and affected these ecosystems in a multitude of ways," said Mr. David Sheppard, Director-General of SPREP. "SPREP has been working with CITES and the Convention for Migratory Species (CMS) to promote conservation measures. The CMS focal point for Oceania, Fiji, has just proposed the listing of ten species of rays on the CMS Appendices, which SPREP is supporting." Offering SPREP's support for the launch, Michael Donoghue, Threatened and Migratory Species Adviser, stressed that the Pacific Shark Heritage Programme was particularly welcome because if offered a new approach to conservation following the failure of fishery agencies to arrest the rapid decline in shark populations in the Pacific Islands region. "By developing truly sustainable strategies, the Programme will offer practical solutions and assistance to both fisheries management and shark-based eco-tourism, so that Pacific Island nations and communities benefit from careful stewardship of their natural resources," he said.